I hope you're all doing well, today. I thought I'd spend a little time today talking about the upcoming Fourth of July holiday. This is always such a fun family holiday to celebrate. No doubt, you have your family traditions, maybe a church or community tradition as well. There's always backyard fun and games, great food and fireworks to celebrate this great day. Still, I think it's important that we take some time as parents to make sure that we're teaching our kids that this day is significant for far more important reasons than good food and fun games. 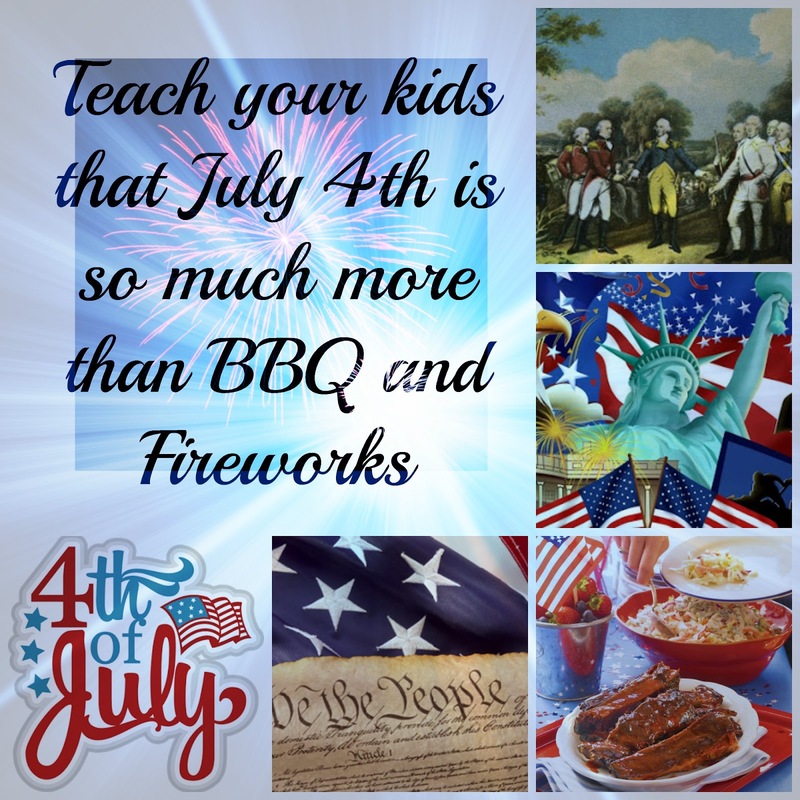 It's About History--Kids should have an understanding that the 4th of July signifies just about the most important thing in American History: our independence from Great Britain. An independence won after a hard fought Revolutionary War. Take time to talk about the important people of this era. Kids Konnect has some great worksheet resources for American Revolution activities you can do with your kids. You can also find mini biographies of important figures during this time period at American Revolution. Find a copy of the Declaration of Independence and talk about the important passages and why they matter so much. This website has great videos and activities broken down by age and grade level. It's about Freedom-- Kids should know what Freedom means. This is a great opportunity to talk with older kids about countries and people who aren't free. How would our country's history been different if we had not gained our independence from Great Britain? How do we protect our freedom still? Take this opportunity to express appreciation for our military and their families who sacrifice so much to protect us. When the day has come to an end, and you're waiting for the fireworks to begin, gather the family around and watch a movie that celebrates the spirit, history and love of America. There are so many that fit the bill for this; but I have included a brief list to give you a few ideas. I tried to include films for both younger kids and older kids. Enjoy the fireworks, celebrate our freedom, remember those who stand in harm's way every day to protect us and those who have given their lives for it. Eat lots of great food, wear your red, white and blue loud and proud, wave your sparklers and have a fantastic 4th of July! I love this! I've been sitting here planning different July activities, and I love the idea of incorporating the history. Your movie suggestions are perfect, and I see a few movie marathon family nights in our future! A great post Dori, the true meaning of many celebrations seems to have been forgotten.